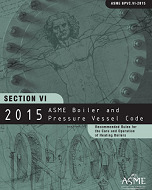 BPVC-VI-2015 covers general descriptions, terminology and operation guidelines applicable to steel and cast iron boilers limited to the operating ranges of Section IV Heating Boilers. It includes guidelines for associated controls and automatic fuel burning equipment. Illustrations show typical examples of available equipment. Also included is a glossary of terms commonly associated with boilers, controls, and fuel burning equipment.